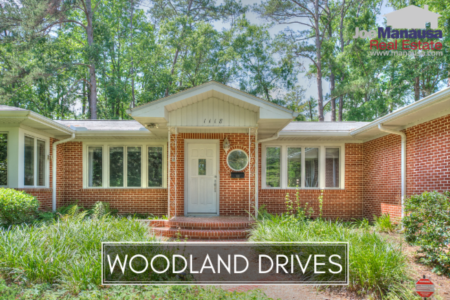 Nothing says "Downtown Tallahassee" better than the neighborhood of Woodland Drives, and if you want a home with some history within a few miles of the Capitol Building, this might be the subdivision for you. This popular community is situated adjacent to Capital City County Club and just south of Lafayette Street, and it hosts some of Tallahassee's historic homes. While most of its homes were constructed from the 1940s through the 1990s, there are several that date back into the 1800s. Unlike many of the "boom neighborhoods" that we have discussed in recent housing reports, a well established neighborhood like Woodland Drives is not going to have the compression effect of many families that need to move all at one time. In this report, we will look at average home price trends, value trends, and size trends of homes sold in Woodland Drives, as well as all current listings in the Tallahassee MLS and all closed home sales going back to 1991. It is important to note that the narrative contained below is for sales through December for all previous years, but through mid July in 2015. The graphs and the closed sales table will be continuously updated into the future (meaning bookmark this page if you always want to know the current status of homes in the Woodland Drives). Average home prices are 7% lower in 2015 versus 2014 as many of the smaller homes in the neighborhood have been selling. Current prices are roughly 23% below the highest level recorded in 2007. The average recorded sales price is $184,722 for Woodland Drives thus far in 2015, but expect this number to shoot above $200K when some of the "normal" size homes begin to sell. With three of the four homes currently for sale being on the smaller end, I would think higher prices will not happen this year. Coming off the best year for home sales in 8 years (20 homes sold last year), we aren't surprised to see the pace a bit slower this year. 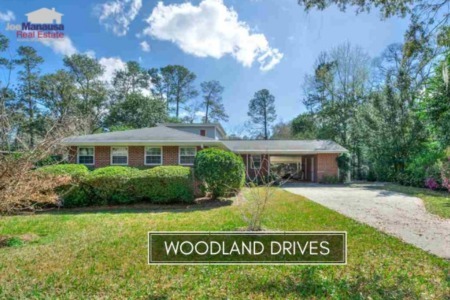 Thus far in 2015, there have been 9 closed home sales in Woodland Drives, which is slightly slower than the pace set last year. Average home values in Woodland Drives rose 22% in 2014, so the fact that they are flat (and haven't given some back) this year is a small victory for current homeowners. The average value for homes sold this year is $106 per square foot. Through mid July, the average value of a home sold in Woodland Drives is 22% below those recorded at the peak of the market, and 29% above those recorded at the bottom. I would say the recovery of values is beyond the mid point. The average home size sold in Woodland Drives typically falls in a range of 1,600 to 2,200 square feet, and this year buyers have been selecting homes towards the lower middle of this range. The 9 sales thus far in 2015 have averaged 1,789 square feet. I hope you enjoyed our July 2015 update on home sales in Woodland Drives, please feel free to drop me a note if you have questions not covered in this report.